Impossible Bike Stunts 3D is the bike driving game in which you get to jump behind the handle bars of an insane super bike. The track has twists, turns and obstacles at every point along the way. Meaning that your skills will be pushed to the very limit. Maneuver your bike around all of the obstacles put in front of you. Perform stunts and tricks but make sure that you stay on the track. Otherwise you will fall from the sky in dramatic fashion. After each level that you manage to complete successfully you will earn money which can be exchanged for bigger and better bikes. 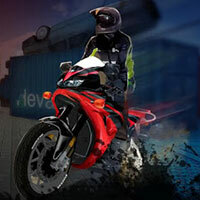 Enjoy and have fun in playing Impossible Bike Stunts 3D Game. Good luck. Also make sure to check out Stunt Mania 3D Game, you may enjoy playing it.